On 15th July we will wish you happy St Swithin’s day here at Geoffrey Miller Solicitors. Everybody knows the old legend: if it rains on St Swithin’s day then it will rain for the next forty days; if the sun shines then we can expect good weather for forty days. This is the old proverb. We imagine this is exactly how our clients feel when then first get in touch in need for motoring law advice! St Swithin was the Bishop of Winchester. He died in around 862 AD and was famous for touring his diocese on foot. He would not have needed a specialist motoring solicitor to defend him for speeding or drink driving. If he ever comes back and becomes Bishop of Winchester again then we can suggest a few legends based on the number 40 that he might like to use. If you break the 40 mph speed limit then you can expect some attention from the police. The Association of Chief Police Officers have produced guidelines suggesting how the police should deal with drivers going over the limit. 41-45 mph means that no action will be taken; for 46-53 drivers are normally offered a speed awareness course; 54-65 usually leads to a fixed penalty ticket; over 66 mph and a court appearance it likely. There are other guidelines in place for all of the speed limits from 30-70 mph. We do not lose many cases in the Magistrates’ Court. We take scores of drink driving cases to trial every year – most of them are successful. We also represent drivers who have reached the 12 point limit and we usually help them to keep their licence. On rare occasions the court do not find in our favour. If that happens then we can take the case to appeal in the Crown Court. Section 40 allows the courts to suspend the driving disqualification whilst we are waiting for the appeal to be heard. If a driver is convicted of a motoring offence or if they receive a fixed penalty (usually from the police) then their driving licence will be endorsed. Points remain active for three years although they are normally printed on the paper licence counterpart for four. DVLA have a list of codes for all of the different offences. CU40 is the code for driving a vehicle with defective steering. It’s pretty rare for us to see that code on a licence but here’s what St Swithin might say about it. Drivers who get 12 or more penalty points in three years can normally expect a minimum driving ban of 6 months. If we can persuade the magistrates that a ban would cause exceptional hardship either to the driver or to someone else then they will not usually be banned at all. Our record in the last few years is 31 points and no driving ban – we have never had a case with 40 points but if we got one we would fight to the bitter end. The legal limit for drink driving is 35µg/100ml of breath. If the police suspect that someone is drink driving then they normally take them to the police station and breathalyse them. If the reading is below 40µg/100ml then the police do not normally prosecute and will take no further action. We suggest that you do not test your luck. It’s always better to stick to soft drinks if you are taking the car. 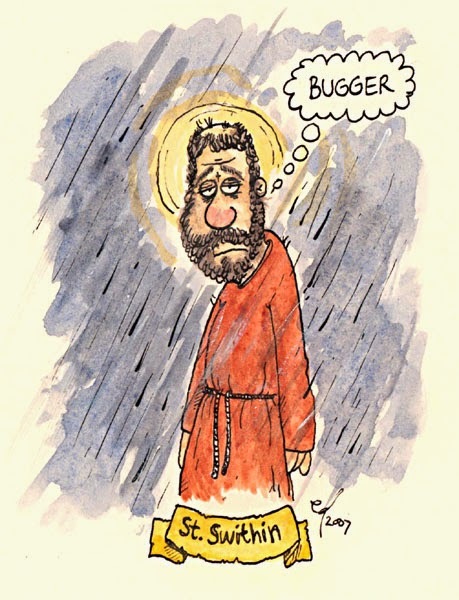 Happy St Swithin’s Day and here's hoping for good weather. If you require advice regarding any of the above motoring offences, we appreciate the situation you face is no laughing matter but hopefully we can help you to feel relief when we guide you through your options. Please give us a call on 08000 85 27 84 for a "no strings" chat with a member of our expert motoring law team. Reckless driving in Virginia, 76 / 55, need advice?